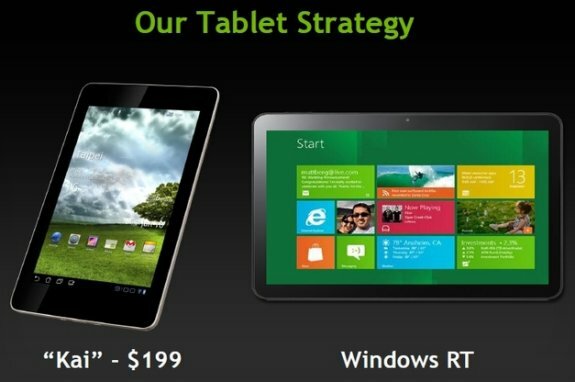 The Verge reports NVIDIA teased "Kai", a new Tegra 3 based reference design for Android 3.0 that promises to hit the $199 price point. NVIDIA didn't have much to add when asked about Kai, and revealed the its clients are already using the Kai platform to build upcoming tablets. Does that make Kai a reference design? Probably yes, but we wouldn't be surprised if it's also a consumer product. Nvidia and Asus teamed up at CES 2012 to introduce a quad-core tablet with a then-unheard-of $250 price point, the ME370T, and it's a dead ringer for the Kai in the picture above. We haven't heard a thing about the ME370T since CES, but perhaps it's on the way, and if we're lucky, it's the first of a whole new wave of affordable Tegra 3 slates. Maybe Google's Nexus tablet will be among them.